Thread: Help me pick a color, please? Or maybe two colors. I have so many UFO's and WIP's that, of course, I've been happily playing in my scraps and avoiding all those projects. I started out to make a crumb quilt, inspired by Bonnie Hunter http://www.quiltville.com and by a "Crumb Along with Me" project on the blog Jo's Country Junction (http://www.joscountryjunction.com/?page_id=4906). So, out come the crumbs and strings. But I had trouble just sewing pieces together randomly....and I made a bunch of four patches, wonky flying geese, etc. My only rules were: (1) 6.5 in blocks and (2) some red or blue (or both) in each block. Now I have almost 70 of these blocks and had a lot of fun playing with scraps. The first photo shows the blocks on my design wall. 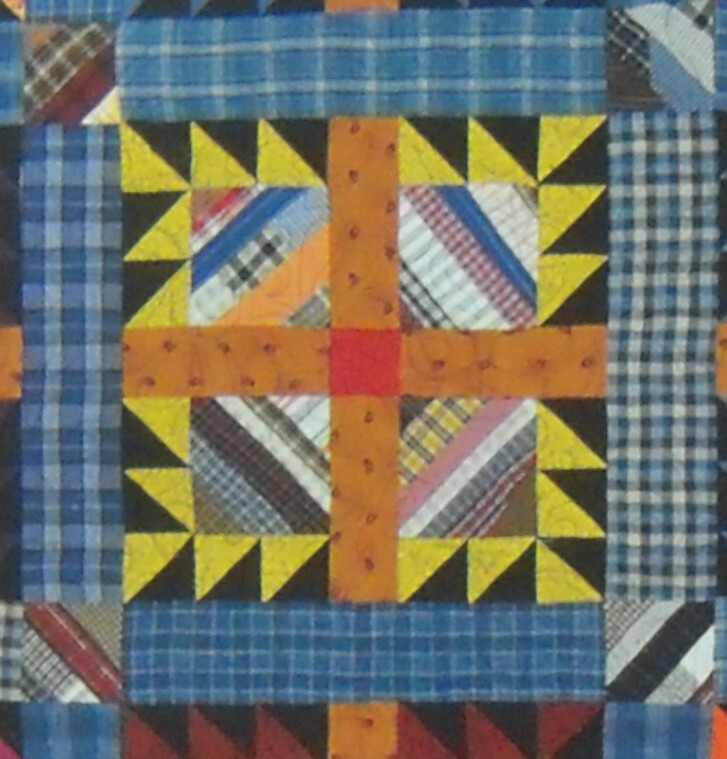 The second photo is from a Bonnie Hunter quilt and it is the setting I want to use....a 14" block composed of four of the crumby blocks plus sashing, and then wider sashing between the 14" blocks. I wouldn't do the HST's around the blocks like Bonnie did. What I can't decide is the colors for the two sashings. To my eye, the dominant color in the blocks is the dark blue. To DH, his eye sees mostly the reds. I don't care for the gold in Bonnie's block but I'm thinking maybe a dark or burnt orange for the sashing within the blocks. And I'm clueless about what I want for the sashing between the blocks. Help me out with color ideas, PLEASE!! I'd use a denim blue. What ever you choose will come out great! I see a lot of red too. What about a tan, khaki, or a brown for your sashing? As for your border(s), you could do a thin red border and a thicker navy border. Hope that helps some. blue, but go light, not dark! I see red first. I also suggest a lighter sashing to highlight the blocks. I would take a dozen or so of the blocks and head for the quilt store. I don't think either red or navy is the right color for either of the sashings but I'm not sure what would work. A green might even be the right choice since it's complimentary to both red and blue but you'd have to lay some blocks out and find just the right green. Red appears to be the dominant color to me. I agree with a grey or Tan sashing... Unless you want Blue to be your dominant color. Then use Blue - it will drive the red back. I think the dominant color is red. I like the idea of a dark tan for sashing, the burgundy suggested by quiltnan sounds good too.But sizzle queen had a great suggestion, audition different colors, and see which looks best. lay out a color and put your quilt blocks on it, take a pic, repeat with other colors, the look back at your pics. Sometimes its easier to flip between pics for a comparison. The red is what pops out ... maybe a denim blue, as dublb suggested, definitely lighter blue, will balance the red and help the blues show up better - with perhaps an reddish orange square at the center of each 4-square, then a reddish brown or deep red around the 4-squares - not sure what cornerstone would work, maybe the orange again with the brown, or a deeper blue (not as dark as navy, just deeper than the denim) with the deep red - with such a scrappy design, the more colors the better, I would think. 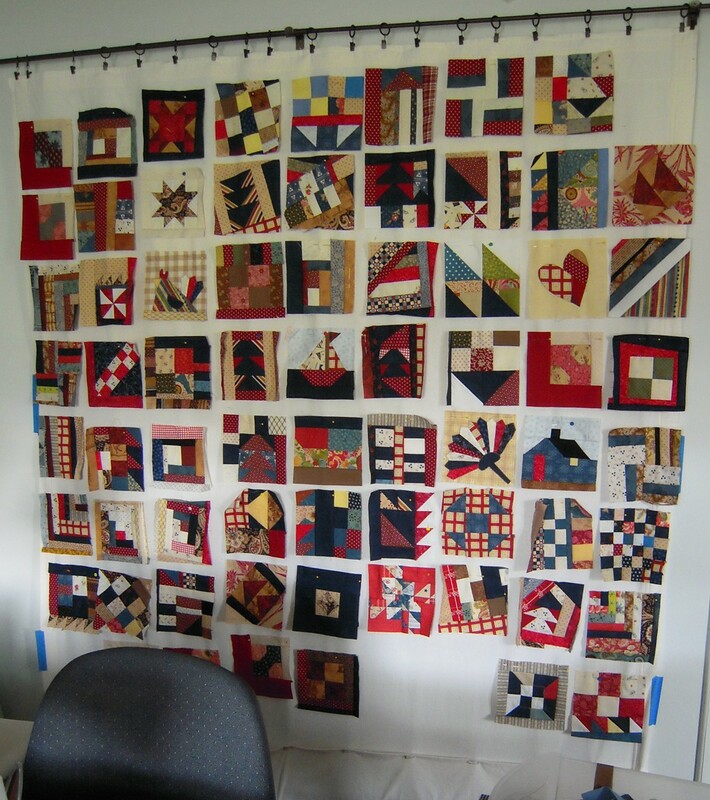 And don't forget to show us the final result, I love seeing all the scrappy quilts here! I agree w/MdmSew'n'sSew be sure & post a pict here or the link for where you do post it. You could use blue with red corner blocks - but I think that would make the quilt too dark. You could use red with blue corner blocks - that might make the quilt too bright. You could use tan with red corner blocks - that would be my choice. Thanks for the suggestions so far. I probably will take a bunch of the blocks to my LQS. I had thought maybe a burnt orange for the sashing within the blocks, but that might be too much....maybe just the cornerstones as MdmSewnSew suggests. Denim blue is a good suggestion too. I have something in that color..a tone on tone...that might just work. Gotta head to the stash to find it! You think like me, MadQuilter. When I had only about 30 blocks, all of them looked too dark to me so then I started making lighter blocks. I like the idea of tan with red cornerstones. I've had good luck with a cream or white background with tiny blue print. Not sure why but it lets the blocks stand out while making the whole seem coordinated. I see mostly reds too. I see red first, would go lighter for sashing. audition several different colors. If you are going to use this on a bed then lay the top down to audition your colors. I see lots of red and lots of dark. I would use sashing in a light color, tan, beige, even light blue with black corners. Scissor Queen has a good idea, go to the quilt store and lay the blocks on some different colors. The blocks will tell what color sashing to use.